Valve’s Index VR Set will be shipping on June 15 according to the information that prematurely popped up on Steam. Valve quickly took the page down, but not before the Twitter users Wario64 and Steam Database took some screenshots. 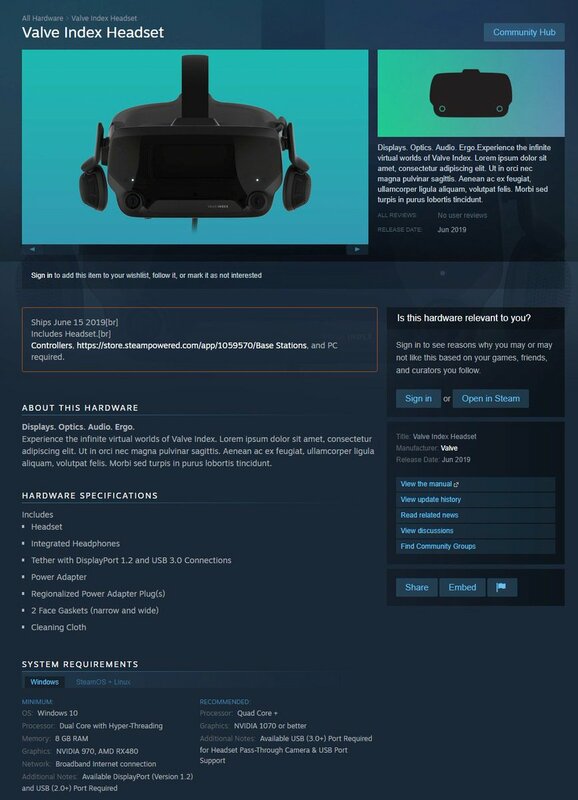 In addition to the ship date, which Valve spokesman Doug Lombardi confirmed to the Verge, the screenshots show minimum and recommended system requirements. While the page was live, it also had the link to another page with information on the base station. However, the tracking cameras on the outside of the headset suggest that the base station will be optional. As will be motion controllers called Valve Index Controllers. The headset will come with integrated headphones, power adapter, narrow and wide face gaskets, and, last but not least, a cleaning cloth. Valve intends to make the full announcement of the product on May 1.